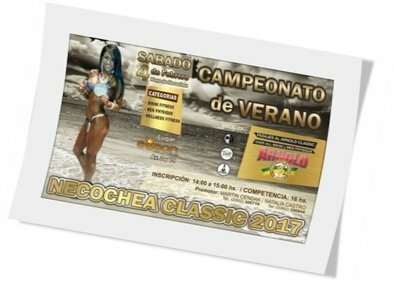 Se llevará a cabo el sábado, 4 de enero de 2017 en el complejo turístico Egeon, Av. 2 y 79, Necochea, Buenos Aires, Argentina. Inscripción: De 14:00 a 15:00 horas. Pasajes al Arnold Classic para el Over All Bikini y Men´s Physique. This entry was posted on martes, enero 31st, 2017 at 3:58 pm	and is filed under Campeonatos. You can follow any responses to this entry through the RSS 2.0 feed.Both comments and pings are currently closed.